Preheat oven to 350 degrees F (175 degrees C). Place ground beef in a large, deep skillet. Cook over medium high heat until evenly brown. Drain fat. Stir in cabbage and onion soup mix; cook 5 minutes longer, or until lightly browned. Set aside. Roll one loaf of bread dough into a 16×8 inch rectangle, then cut into eight 4 inch squares. Spoon cabbage mixture into center of each square, top with 1 small slice cheese and bring up diagonal points, pinching edges closed. Place krautburgers on a cookie sheet coated with cooking spray, and let rise for about 10 minutes. Bake for 20 minutes, or until brown. 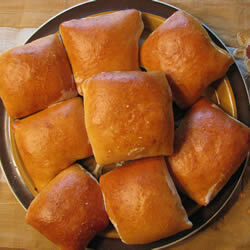 Brush tops of warm rolls with margarine. Repeat process with second loaf of bread and remaining cabbage mixture and cheese.